"Mummy" makeover: Everything old is still new again in Hollywood, as we saw with "The Mummy's" rebirth last weekend. Hollywood handicappers didn't expect Universal and the Sean Daniel Company's PG-13 rated 3D reboot of "The Mummy" action adventure franchise to kick Warner Bros., DC Entertainment and Dune Entertainment's "Wonder Woman" out of first place – and they were right. The "Mummy" makeover awoke in second place to a sleepy $32.2 million at 4,035 theatres. Earlier in the weekend, Hollywood handicappers were projecting only a $30 million launch. Nonetheless, this is the lowest opening for a "Mummy" franchise episode (see details below) -- and even less than the modest $36.1 million opening for the 2002 spinoff "The Scorpion King." The new "Mummy" reportedly cost $125 million to produce – and some accounts claim it was much more than that. This looks like another case of really rotten Rotten Tomatoes scores steering moviegoers in other directions. "Mummy's" 17 percent score is lower than anything else on the current Tomatometer. "Diary of a Wimpy Kid: The Long Haul" is only slightly less rotten at 19 percent and "Baywatch" is just a bit better at 20 percent. "WW" kept her boxoffice crown with $57.2 million, down by only an amazing 45 percent in weekend two. Its domestic cume is now $205 million. Internationally, it's done about $230 million to date in 57 territories. Happily for "Mummy," it's showing much better signs of life in wide international release -- with $141.8 million in ticket sales last weekend in 63 territories, per comScore, bringing its global cume to $174 million. It set a record, comScore senior media analyst Paul Dergarabedian said Sunday, "as Tom Cruise's biggest international opening weekend ever. 'War of the Worlds' was the previous record holder with $102.5 million. "This makes 'The Mummy' Tom Cruise's biggest worldwide opening weekend ever as it tops 'War of the World's' $167.4 million opening." "WOW" opened June 19, 2005 via Paramount to $64.9 million domestically. It wound up doing $234.4 million domestically and $357.5 million internationally. Directed by Alex Kurtzman ("People Like Us"), "Mummy" stars Tom Cruise, Sofia Boutella and Russell Crowe. The series, whose four related titles since 1999 have grossed $550.9 million domestically, is rooted in Universal's classic 1932 horror film "The Mummy." Directed by Karl Freund ("Mad Love"), it starred Boris Karloff as the sleeping mummy Imhotep. In this reboot, the mummy's a woman for the first time – with Boutella playing the ancient princess Ahmanet. "Mummy" is the first title to surface in Universal's new Dark Universe of rebooted movie monsters. DU echoes two already established superhero driven portfolios -- Disney and Marvel's Marvel Cinematic Universe (MCU); and Warner Bros. and DC Entertainment's DC Extended Universe (DCU). 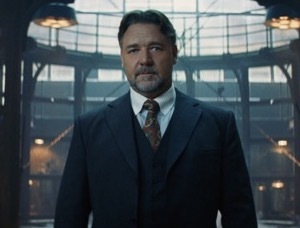 With an eye on DU's future, the new "Mummy" introduces the character Dr. Henry Jekyll (Crowe). While the Marvel and DC universes are populated with legendary comic book characters, Universal's drawing on its classic horror movie characters from the 1920's through the 50's. The studio's Monster Legacy group includes: Dracula, Frankenstein, the Mummy, the Invisible Man, the Bride of Frankenstein, the Wolf Man, the Phantom of the Opera and the Creature From the Black Lagoon. Already on the DU horizon is Universal, Imagine Entertainment and the Sean Daniel Company's reimagination of "Bride of Frankenstein" with a Feb. 14, 2019 opening planned. Directed by Bill Condon ("Beauty and the Beast"), it stars Javier Bardem as The Monster. The original 1935 "BOF" was directed by James Whale ("Frankenstein") and starred Boris Karloff as The Monster. Also in the works is a DU reboot of the 1933 classic "The Invisible Man," starring Johnny Depp as the title character. The original, directed by James Whale ("Frankenstein"), starred Claude Rains as The Invisible Man and his real self, scientist Dr. Jack Griffin. NOTES: Tom Cruise reportedly was a possibility to play the American adventurer Rick O'Connell, who awakens Imhotep, in 1999's "Mummy" reboot. Cruise's credits at the time included: "Top Gun," "Rain Man" and "Mission: Impossible." There also were reports about Leonardo DiCaprio as an early choice to play Rick. DiCaprio, who already had starred in "Titanic," had schedule conflicts from already being committed to do Danny Boyle's romantic adventure drama "The Beach." Sylvester Stallone was also being talked about as a possibility to play Rick. By then, Stallone had five "Rocky" episodes and two "Rambo" films to his credit. Ultimately, the role of Rick went to Brendan Fraser, whose previous films included "Gods and Monsters" and "George of the Jungle." Sommers is said to have seen Fraser as an Errol Flynn type adventurer who would fit well with "Mummy." Universal reportedly told Sommers the day after "Mummy" hit theatres that it wanted him to do a sequel. "Mummy" was the eighth biggest grossing domestic film of 1999. (2) TITLE: "The Mummy Returns"
NOTES: The sequel's title doesn't appear until the end credits. While that was unusual at the time, it's a technique filmmakers use today to get moviegoers right into the stories they're telling. Brendan Fraser (who's uncredited) and Arnold Vosloo re-teamed with Stephen Sommers for the 2009 sci-fi action adventure "G.I. Joe: The Rise of Cobra." Dwayne Johnson, who played the sequel's Scorpion King character, returned in that role in the related 2002 spinoff "The Scorpion King." Johnson also has his own "G.I. Joe" franchise connection -- having starred in the 2013 sequel "G.I. Joe: Retaliation," directed by Jon M. Chu ("Step Up" 2 and 3). "Returns" was the sixth biggest grossing domestic film of 2002. (3) TITLE: "The Scorpion King"
NOTES: The "Scorpion" spinoff is a prequel to the sequel "Returns" rather than a new episode of the franchise. "SK" was the 30th biggest grossing domestic film of 2002, a real nosedive from "Returns." (4) TITLE: "The Mummy: Tomb of the Dragon Emperor"
NOTES: Maria Bello played the role of Evelyn that Rachel Weisz played in the series' first two episodes. There were reports at the time that Weisz didn't want to play a character who now had a 21 year old son. Other reports claimed that what Weisz didn't want to do was spend five months filming in China away from her real life young son. "Dragon Emperor" was 2008's 25th biggest grossing domestic film, faring only a little better than the "SK" spinoff did. Bottom line: Last weekend's domestic ticket sales were about $143 million, per comScore, down 6.3 percent vs. $152.6 million a year earlier when "The Conjuring 2" opened to $40.4 million. Last weekend also saw the sixth place opening of A24's R rated horror thriller "It Comes at Night" to a not-so-thrilling $6 million at 2,533 theatres. This despite an 86 percent RT Certified Fresh score from critics that moviegoers apparently ignored. The good news is that the film reportedly cost less than $5 million to produce. Directed by Trey Edward Shults ("Krisha"), it stars Joel Edgerton, Christopher Abbott and Carmen Ejogo. The 2017 boxoffice to date is $4.991 billion, according to comScore, up 3.2 percent vs. $4.836 billion this time last year. Thanks mostly to "WW," the year is starting to recover. A week ago, 2017 was ahead by 2.8 percent and the week before it was up just 1.9 percent, per comScore.